She attended country grade school through the eighth grade, graduated from Johnson High School and then attended Peru State College attaining her teaching certificate. She taught for one year at Roosevelt country school. She was united in marriage to Wilbur Heuke on August 8, 1943 at the Martin Luther Church, rural Johnson, Nebraska. Wilbur and Leola made their home in rural Johnson County, Nebraska where they raised their four daughters. Leola worked side by side on the farm with her husband Wilbur, doing chores and raising animals. She enjoyed gardening, sewing, quilting and traveling. Leola was an active member of Martin Luther Lutheran Church and assisted the Martin Luther Women in many service projects. 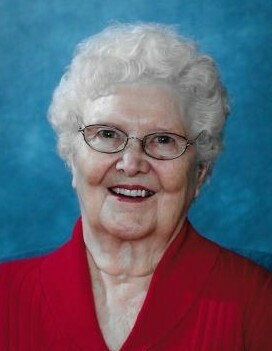 Leola taught Sunday School and Vacation Bible School for many years. Wilbur and Leola retired from farming and moved to Tecumseh in 1979. Wilbur passed away August 15, 1994. Leola moved to Lincoln in 2006. She is survived by her daughters, Sharon Kvalevog and husband Robert of Wasilla, Alaska, Donna Wlodarski and husband Walter of Basking Ridge, New Jersey, Colleen Othmer of Lincoln, Glenda Bates and husband Don of Elk Creek, 10 grandchildren, 20 great-grandchildren, sisters-in-law, Vivian Fintel, Joni Fintel and Marvel Heuke. Leola was preceded in death by her parents, husband Wilbur, son-in-law, William “Bill” Othmer, brothers, Ervin Fintel and DeWayne Fintel, sister, Edus Rippe and brothers-in-law, Hershel Rippe and Raymond Heuke. Memorial services will be held at 10:30 a.m. Saturday, October 8, 2016 at the Martin Luther Church, south of Johnson, Nebraska, with Rev. Ken Tubbesing officiating. Visitation will be at the Wherry Mortuary in Tecumseh, Nebraska, Friday, October 7, 2016 from 9:00 a.m. to 8:00 p.m., with family greeting friends from 5-7 p.m. There will be no viewing at the church. Memorials may go to the family’s choice. Inurnment will be in the Martin Luther Cemetery, rural Johnson, Nebraska. Online condolences may be left @ www.wherrymortuary.com.